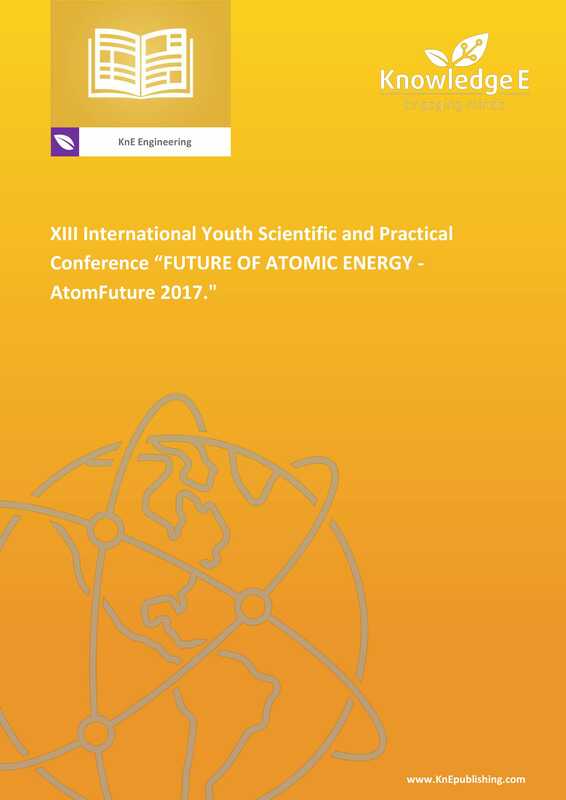 XIII International Youth Scientific and Practical Conference "FUTURE OF ATOMIC ENERGY - AtomFuture 2017"
The participants of this scientific conference include students, masters and graduate students, young scientists engaged in research work under the guidance of scientists of scientific research institutes, enterprises, and specialized universities of the nuclear industry. Conference topics: Calculation and design of nuclear power reactors; design and operation of nuclear power plants; perspective methods of obtaining and transforming energy; control, management, and diagnostics of physical installations and industrial facilities; ecology and safety of nuclear energy; information technologies in nuclear energy; medical radiology; new materials; and development of nuclear energy and the role of professional non-governmental and public organizations. Editors: Yu. V. Levchenko and Yu. E Karazhelevskaya. Makarenko E.S,	Oudalova A.A.,	Geras'kin S.A.
Demin, V. M.,	Abu Sondos, M. A.,	Smirnov A.D.
Kryukov I.S.,	Kozyr D.V.,	Mukhamedov K.A. Lavrentyeva G.V.,	Zaharova V.R.,	Mirzeabasov O.A.,	Synzynys B.I. Pham Bui Dinh Lam,	Kolesov V.V. Anisimova A.I.,	Kopin M. R.,	Allenykh M.A. Dumen, V.M.,	Ternovykh, M.Y.,	Abu Sondo, M.A. Salakhova A.A.,	Suvorov V.A.,	Firsova A. I.,	Belozerov V.I.,	Milinchuk V.K. Orekhova E.E.,	Andreev V.V.,	Tarasova N.P. Raspopov D. A.,	Belousov P.A. Nasedkina N.V.,	Beketov E.E.,	Isaeva E.V.,	Malakhov E.P.,	Golovanova O.Y.,	Ulyanenko L.N.,	Chernukha A.E.,	Saburov V.O.,	Lepilina O.G.,	Ulyanenko S.Е. Karazhelevskaya Yu.E.,	Kolesov V.V.,	Kochnov O.Yu.,	Terekhova A.M.
Balakin B.V.,	Kuzmenkov D.M.,	Kutsenko K.V.,	Maslov Yu.A.,	Saparbaeva N.A.,	Kharitonov V.S. Bahdanovich R. B,	Pázmán K.,	Tikhomirov G. V.